Hey guys! 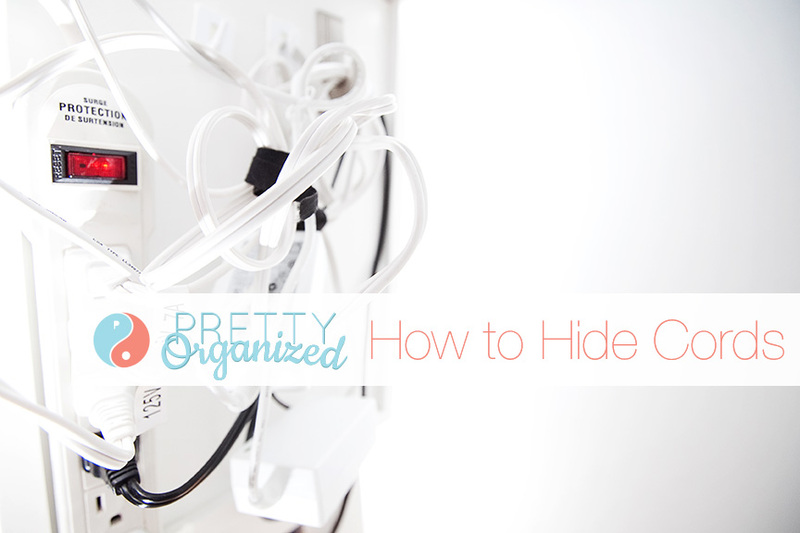 I’m in the middle an office organization project, and I figured I’d share a few quick tips & tricks for organizing one of the most common office clutter issues: cable management. Say hello to my little friend: the CableBox from Bluelounge. 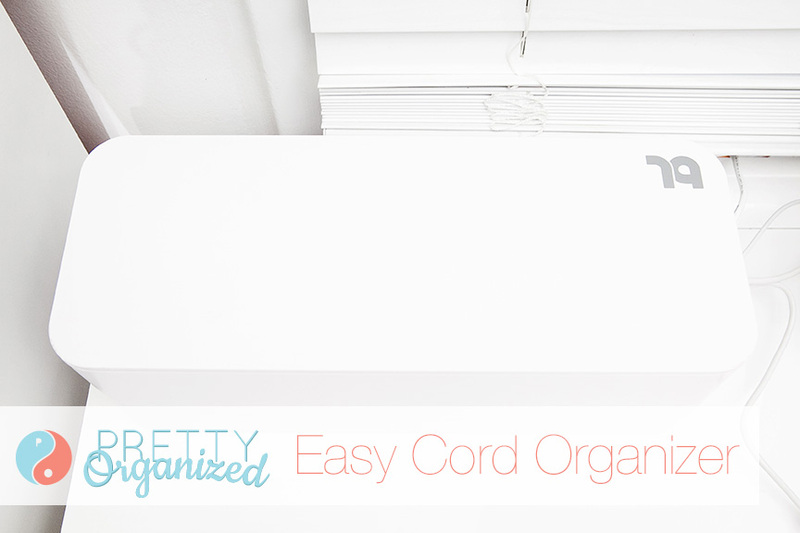 It is definitely the easiest cable organizing solution on the planet! We actually have another one in our living room to organize our tv cords, too! You could probably use any storage box to achieve this goal, but I like that the CableBox is made from fire retardant plastic. Safety first! This pretty little container stores both of our external hard drives & my power cord. Look at all of those wires! Just shove your stuff in there, close the lid, and everything looks gorgeous! 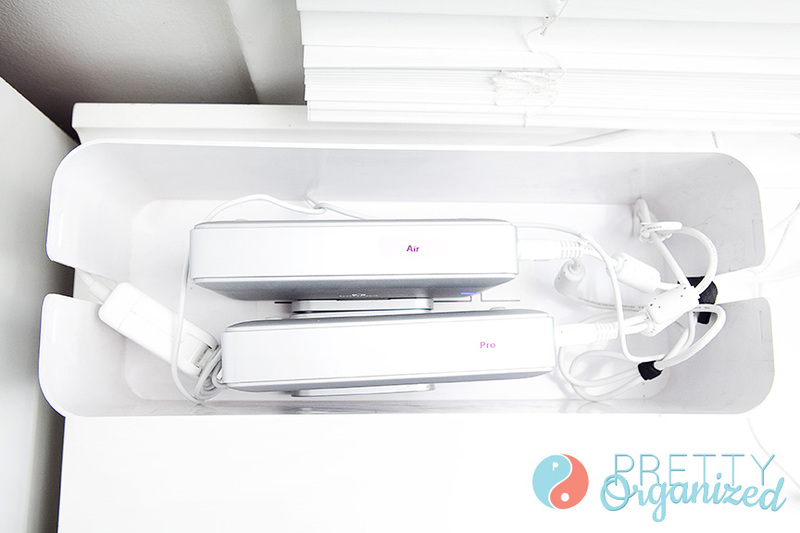 Thirty second office organization — SCORE!! 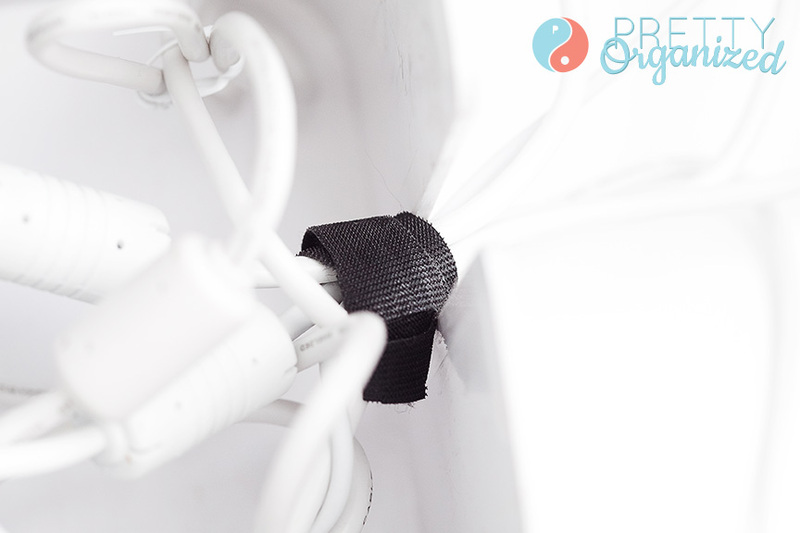 Hint: you can detangle your cords even more if you wind them up & secure them with a twist tie or some velcro cable ties. This little zip tie keep the cords from looking like a ton of spaghetti where they come out on the other side. I also did a little bit of MacGyvering to hide the power cords where they hang down from the desk to reach the outlet. I used what I had on hand to mount all of these cords behind my desk. A combination of 3M Command Strips, Bluelounge CableDrops (not pictured), 3M Command Hooks, velcro zip ties, and a few surge protectors keep all of my cords hidden and up off the floor! 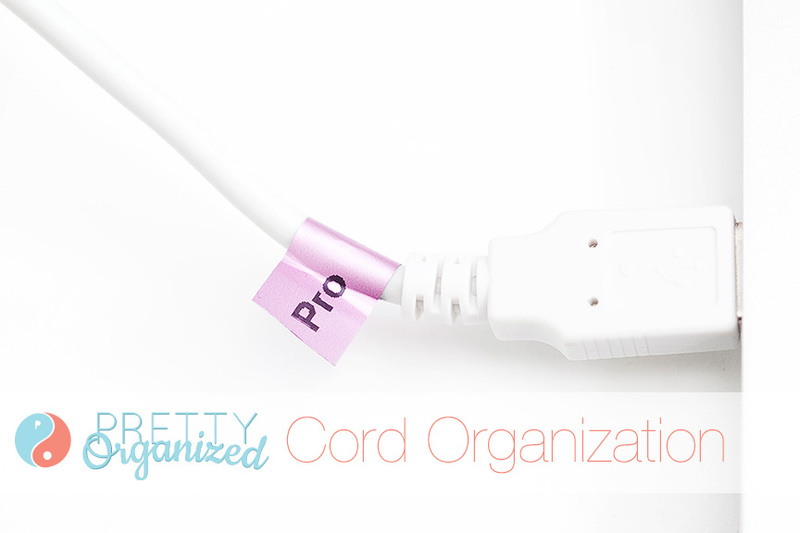 I think the 3M Command Cord Organizer Pack would work well for this, too! Warning: you should be careful about ventilation & check any safety regulations before you rig something up. I’m not a fire chief! Tada! No cords under my desk, and a nice, clean work surface with all of my gadgets hidden from view. Easy solutions are the BEST! Psst: yes, this is also a sneak peek at my office makeover project (it’s still in the works!). I love, love, LOVE my new pens & pen cup from Poppin and my gray chevron storage bin from The Storage Loft! Oh, and if you’re interested, you can click the link to read more about that cute little greeting card organizer on my book shelf! Do you have any office organization tips to share? I’d love to hear them! Oooh, I have been eying up those cable boxes. Your organization looks incredible as always. And thanks for the sweet blush-worthy comment. Aww, thanks Jen!! I really appreciate you stopping by! Thanks for sharing! I discovered those velcro zip ties about a year ago, and I am obsessed with them! I use them for so many other random things around the house. Such an easy and amazing lifesaver!! YES!! They are so awesome!! How have you put them to use? I’m always looking for new ideas if you’re willing to share! Ha! Thanks so much! To be fair, I did wear my hair in a mullet the entire time, & later that day I restored a car engine using old chewing gum and a toothpick.